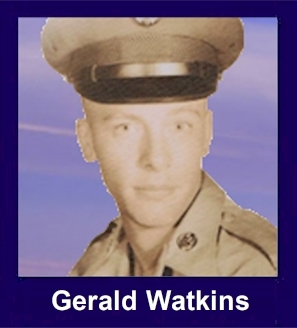 The 35th Infantry Regiment Association salutes our fallen brother, PFC Gerald Edward Watkins, who died in the service of his country on June 21st, 1967 in Quang Ngai Province, Vietnam. The cause of death was listed as Mine, Crossing River North of Duc Pho. At the time of his death Gerald was 18 years of age. He was from Washington, DC. Gerald is honored on the Vietnam Veterans Memorial at Panel 22E, Line 35. The decorations earned by PFC Gerald Edward Watkins include: the Combat Infantryman Badge, the Bronze Star with V, the Purple Heart, the National Defense Service Medal, the Vietnam Service Medal, the Vietnam Campaign Medal and the Vietnam Cross of Gallantry with Palm Unit Citation. Gerald graduated from Oxon Hill Senior High School in Oxon Hill, Maryland in 1966. Jerry was a dear friend of mine in high school. We graduated in June 1966. I lost touch with Jerry after graduation. I remember Jerry as kind, honest, and funny. He used to make fun of the way I walked and said I walked like a duck. He affectionately called me "The Brat," and he was right. I remember my utter disbelief when I learned that Jerry was killed in Vietnam, and the rush of pain when I first saw Jerrys name on The Wall. I will always remember Jerry and grieve for his life that was cut short way too soon. I remember the day Jerrys family was informed of death like it was yesterday. His sister Kathy and I were visiting a friends home (The Halls) and were playing gin. Her brother Barry came to the door and said she needed to come home immediately. My stomach turned and I knew what had happpened. Ive lost track of the family, but Ive never forgotten them. Jerry was too young to die.